Finally a "true air brushed flame" graphic for you car, for years graphic manufactures have been assimilating air brushed art on their computers only to achieve very generic looking imitations of the real thing. 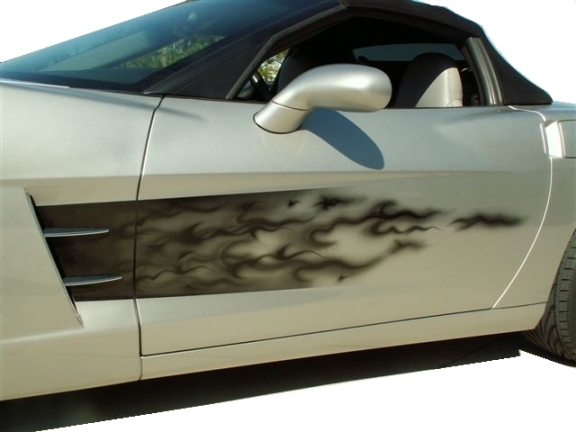 This graphic has been beautifully air brushed by "Jaymz Air Studios" and has been enhanced and replicated with all its true values our design studio to bring to you a truly awesome air brushed flame graphic specifically designed for you C6 Corvette. The graphic has been digitally printed and laminated using the finest vehicle wrap technologies and has a 7-10 year exterior life. Simply wash and wax with the rest of your car for years of enjoyment.